Research is ongoing into the pathology (working) of several thyroid disorders, diseases, cancers, auto-immunities, auto-antibodies, T-cells, B-cells, levels of natural and artificial hormones and vitamins and minerals, as well as the psychological, neurological and endocrinological symptoms. There is also a vast range of research into the long-term effects of various treatments and their effectiveness under varying conditions. Also of interest is the constant reassessment of “normal” levels for natural thyroid production against which abnormal levels can be measured. 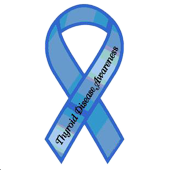 Clinical treatment depends upon assessment of thyroid levels combined with physical, mental and emotional symptoms. Research is also underway into preventing autoantibodies from attacking the thyroid. This research has been successful in mice but is many years away from clinical trials in humans. Stem cell thyroid research is also underway. To learn more about any of these research topics, we recommend you try an internet search using PubMed, visit our Helpful Links pages, or try NZORD's suggestions on Rare Disease Information (Health Information on the Net is a great start).